Discussions of design leadership tend to look upward, toward the executives and directors who sit atop the organization. And while those folks are indeed important, their efforts overshadow what I’ve realized is the most impactful role in a design organization: the “lower-middle management” of the Design Team Lead. To make sure we have a common understanding, let me illustrate. Here’s a design organization close to 50 people, lead by a VP, who in turn has Design Directors (DD) reporting to her, and they in turn each have three Team Leads (TL) reporting to them. There are 5 squads dedicated to different aspects of the e-commerce experience. Each squad has a Product Manager (PM) and some usually around 6 to 8 Engineers (E). 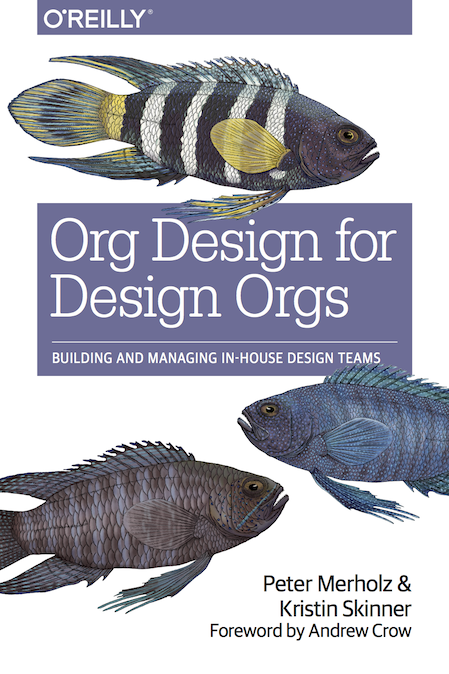 Instead of designers embedded in squads, they work across a range of squads (we explain that in Chapter 4 of the book). The Team Lead does double duty as both a leader, peering with a Director of Product (DP), and a Director of Engineering (DE), and working with a squad (here Search/Browse). Team Leads may find themselves in subsequent meetings where they’re at the 1,000ft level of discussion strategy, to the 1ft level of pixels and copy, to the 50ft level of a solid flow and structure. They must navigate these discussions without losing their place or getting the bends. Given this range of activity, Team Leads must excel in three archetypes of the design leader: Coach (managing down); Diplomat (managing across); and Champion (managing up and out). As a Coach, a Team Lead does what it takes to get the most out of the team. They recognize that the team is not an extension of themselves, but a unit of individuals where, when orchestrated well, the whole can be greater than the sum of the parts. The Coach establishes the parameters for success, creates a Big Picture vision that directs the team’s efforts, provides guidance in technique, and holds team members accountable when they don’t measure up. As a Diplomat, the Team Lead often finds themselves in challenging discussions where other functions are asking the design team to behave in a way that is suboptimal. The Diplomat must assume positive intent on everyone’s part, and educate non-designers to help them understand the nature of Design’s contribution, how Design works best, and how to integrate it in the flow of cross-functional work. The Diplomat needs to strike a balance of being a cross-team player, with some flexibility in their approach, while not being such a pushover, or get-along-to-get-along, that they neglect their values. As a Champion, a Team Lead manages up and serves as their team’s evangelist and protector. Executives and other stakeholders will regularly ask the team to do more than they have capacity for—the Champion must be comfortable with the word, “No.” Executives will fly in for the dreaded “swoop-and-poop,” and the Team Lead can either step aside, and let the crap hit their team (demoralizing them), or they will step up to be the 💩 ☂️, protecting their team’s good work and showing they have their team’s collective back. It is because of all that pivots around them, from the details of delivery to the connecting with big picture strategy, that Team Leads are the crucial (literally, at the crux) role in a design organization. Look at the cross-team diagram above: 6 designers are working with 30-40 engineers, which suggests design efforts have greater leverage. That leverage means a successful Team Lead amplifies their team’s abilities and wields influence throughout the broader organization. But it also means that a weak Team Lead creates a black hole, dragging down not just their team, but their whole part of the organization. If you’re in a design organization that’s growing, Team Leads are important not only for the reasons listed above, but two more that are essential for successful scaling. The first is easy to explain: Team Leads are your front line of hiring. They are motivated to make their teams great, and strong team leads will excel as hiring managers. It was because of the strong team leads I hired that I was able to scale my Groupon design organization from 25 to 55 in 18 months. We can’t expect every designer to work with every other designer. But, as the arrows suggest, we can ask these three Team Leads to coordinate with one another ensuring coherence across all these squads. Hiring Team Leads, or promoting people into this role, must be done with extreme care and high expectations. There’s too much at stake to place someone in this position who isn’t ready yet. Senior leadership (VPs and Directors of design) must expend extra effort to recruit, train, and support Team Leads. That effort, though, will pay off. A transformative experience occurred for me when I was at Groupon. After spending 9 months recruiting and hiring high-quality design leads around whom I could build teams, I found that how I spent my time shifted. Before, I expended much of my effort on recruiting and hiring, management, and operations. I didn’t have the bandwidth for the kind of creative leadership the organization expected of me. Once we had those leaders in place, I could shift my focus to areas that warranted the attention of a VP — strategy and vision; specific high-value hires; incorporating other practices such as creative technology. Basically, with strong Team Leads, the organization can almost run itself. For the kind of nerds who dig this website, I suggest visiting athenahealth’s Experience Design’s recently updated Medium site, with 5 articles related to design org matters. “How we approach DesignOps at athenahealth”, with the different functions DesignOps fills (measurement, research at scale, and design systems), in an attempt to realize efficiencies in order to deliver in an organization where the ratios conspire against you (that whole 85 designers across over 200 scrum teams thing). There’s good stuff here, and it’s all the better as it’s real deal (actual application of different org models and structures), recognizes initial shortcomings (they iterated on their dual-track design leadership ladder), and offers details that can help others figure out how to begin considering these approaches on their teams. In October, I gave a new talk titled Coach, Diplomat, Advocate, Architect, where I dissect these four archetypes of the design leader, and share the difficult news that, in order to fully succeed, that design leader must embrace all of them. It’s my first new material in a couple of years, and though I ended up having to speed through it at the end (I typically put too much stuff in a new talk), I think it came out well. Pretty much every talk was worth watching. Some personal favorites include Stuart Frisby sharing his experience growing design at Booking.com from 6 to 100 (and beyond), Kim Lenox’s frank sharing of how her personal growth allowed her to become a better leader, Ben Terrett’s funny and real grappling with being the bottleneck, and Cap Watkins’ confessional on the neuroses of the design VP. Some videos to queue up for holiday viewing!